As I was thinking about the music David is writing and wondering what the music and lyrics will be like, I began mentally going through the albums he’s done. The first was done with songs written primarily by others, but the second one, “The Other Side Of Down”, was filled with songs that David took part in writing. From what he’s told us, those songs are about his life and his struggles during that time. When he did the cover album “BEGIN.”, before he left, it was filled with songs meant to help others. It reflected his current mind set just before his mission. This entry was posted on Wednesday, May 27, 2015 at 10:11 AM	and is filed under @DavidArchie, David Archuleta, The Voice. Tagged: melodies of life, music of life. poetry, reflections. You can follow any responses to this entry through the RSS 2.0 feed. You can leave a response, or trackback from your own site. While some artists merely sing the lyrics, it doesn’t feel that way when David sings. It feels like he gives us a piece of himself in each song he sings. Local private concert. Hence Kari’s visit and fresh haircut. MT, what an awesome poem. I really, really like it lots! It’s so true what you’ve written about how David writes what is in his heart and then sings it with his heart. I guess that’s why we are each on the ride of our life. David is not only taking us on the ride of his life, but it is creating parts of our own life. I love this ride, and I will stay on it for as long as it is running. Even with all the rollercoastering (I may have just made up that word 🙂 ) that happens it reminds me that life is not smooth – it wasn’t meant to be. Abrra, #2 — Oh to be there! MT – I love your poem. You are a master. Maybe David should work with you on lyrics. As far as his music goes, he’s a true artist. And, true artists always give us a glimpse into their lives or minds. They aren’t looking for a “hook” line to sell more copies of a song, they are trying to reach people with a feeling or emotion. David is a very emotional singer/writer. Can’t wait for his new album. Yes, each song he writes gives us insight into another part of his life and how he feels about it. As David goes through his life (marriage, children, etc.) and as he watches the world change around him, I think he’ll continue to share what matters most to him and we’ll hear about it in his music. Even the genre or style of his music may change over time. We never know, especially with Mr. Chameleon. LOL It gives us a lot to look forward to! That guy just never stops, does he? We may not be hearing from him, but it doesn’t man he’s not constantly on the go. Thanks! I’m so glad you enjoyed the poem. As for “creating parts of our own life” I hadn’t thought about it but it’s true. Not only the beautiful music he’s shared with us that we’ll always have, but I’ve made treasured friendships because of David that will continue to be a part of my life. Aww thanks! But you give me way too much credit. Lyrics would be WAY harder. LOL I agree that David is a true artist. His music isn’t about hooks and sales, it’s about what’s real to him. I hope he’ll continue to not only inspire, but to share his hopes and dreams, his disappointments and triumphs, through song. Those are the things that resonate with all of us and reach us heart-to-heart. MT, what beauty you created. David speaks of melodies and your poem flows like a soothing spell speaking of what we’re waiting for. Love your writing. Very lovely poem MT. So true, the words that describe David’s way of writing and it will be very rewarding to hear his future songs about life through his experiences. I love each and every album that he has released and will love all future albums. They are of him and his voice. Couldn’t ask for anything better! Just a few clips from tonight’s even sent over Lexi Mae Walker’s Periscope account. I have this on my iPad and was able to watch the entire song “The Prayer”. It’s a free app and I searched her name, clicked on “Recent” and found 2 videos with David. 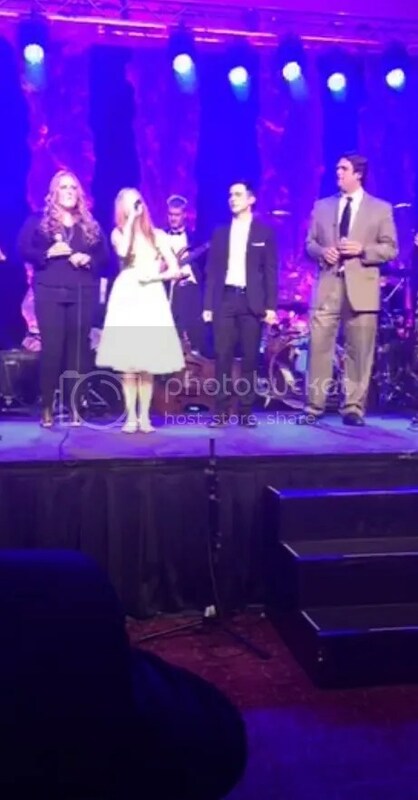 “Live with David Archuleta and Lexi Walker” and “Dare To Dream with Lexi Mae Walker, David Archuleta, Kendra Lowe and Friends”. I did a screen cap from my iPad. I wondered if that was where he was going to be tonight. Dan Clark commented on his own FB page that he was emceeing it. Lucky ducks that got to be there. I want to see all of this! Thanks so much for the peak at David singing The Prayer! Heidijoy, Dja, Jan, Thanks 🙂 So glad you enjoyed it! I’m with you guys about #15. I want to see the whole thing … in HD!! It looks like so much fun! I love to hear him sing with lots of musicians behind him – it seems to really wake him up. Looks to me like he is ready for a TOUR! (waiting not so patiently). This is your BEST poem that I have read since you have been sharing poems! I know you wrote this with David in mind, but these are universal words that could be said by anyone who shares a special talent. Each artist shares a piece of themselves, such as a painter,sculptor, or writer. Each one has their “song” that begins in their soul and comes alive when they share it with us. We at The Voice are blessed that we have you to share a piece of yourself though poetry. Thanks for the videos all! 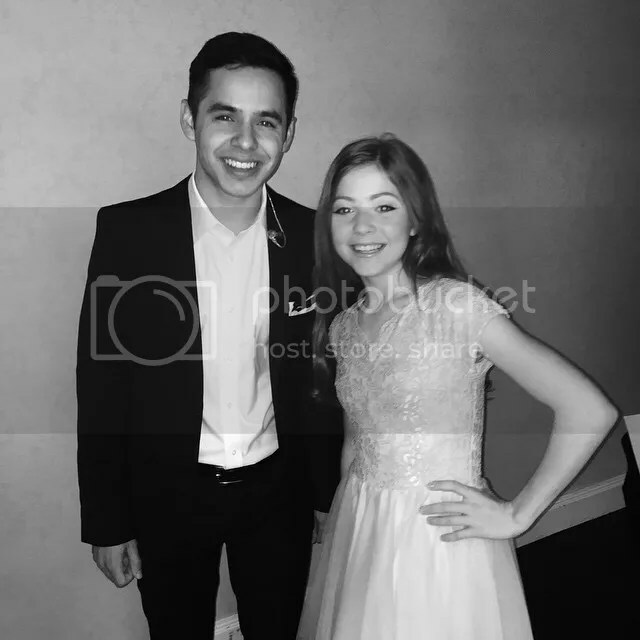 Performing with @davidarchie is one of the best things ever! His light and humility make people around him want to be better and try harder!! I cannot wait for the next glimpse of this guy!!!! I think I just saw @DavidArchie at the airport….!!!! MT, I really love and enjoy your poetry♥ Beautiful! Your thoughts so true…just suits David,and all of us as well. Great job! Well Mr Amazingness was certainly on fire at the benefit! Holy Guacomole and Chips!! I think the Saints Came Marching In ! I know this was a dressy affair, but how can people sit there so still, and not be clapping along to that song!!? Hoping maybe the whole thing will pop up.D was into it! Thanks Abs,Dja,MT,and Lynnella for bringing all these goodies here!!! I hadn’t heard the Tarzan song before, Lynnella! always was a Phil Collins fan,didn’t know he did the song for Tarzan.Didn’t know about the movie either,lol. I think I have been living under a rock. Lynnella, Had no idea about the Tarzan song. Thank you! Skydancer, Djafan – Don’t feel bad, I didn’t know about the song either. Just went on youtube and looked at Disney movie Tarzan, and there it was. When I played it, I knew it was the same song. We all learned something. David should do a Disney Movie. He’d be perfect for one. Abrra, #23… Amen!!!!!!! and Amen!!!!!! Hallelujah!!!! I’m on the road (again — put a little Willie Nelson tune in there) with a not so good laptop. I’ll be reading, but watching videos is sometimes questionable so I will have lots to catch up on next week. I’m waiting ‘patiently’ for the iPad that my hubby is talking about getting for me!!!! I hope you get your laptop. I didn’t think I’d love mine as much as I do. And now I don’t think I can ever go back to a desktop unless I had to. Safe travels. Well, hello, David! He really wanted to let loose in “When The Saints Go Marching In”. Need more footage for sure! Thanks for the video! I also hope David does Disney movie or even a Broadway play. His voice is perfect for songs such as he one in the Tarzan movie. Spotted at the airport now. What a ninja! Beautiful poem MT. Gets me excited thinking of the diverse music yet to come. Another Louis Armstrong song I am anxious to hear and see David sing. I remember when Gladys told us he sang What a Wonderful World in Chile and now the marching saints song. Abrra, I think it is a religious song, isn’t it? Sort of? That’s my kind of religion. So good to see David having fun. Thanks for bringing the video of Strangers like me. I didn’t know the song but I love the way David sounds on it. Thank you so much! I’m so glad you guys enjoyed the poem. That’s one of the nicest things anyone has ever said about my poetry. ♥ And I’m the blessed one, to have a place to share. Nice to see the DRA hitting a million views! That’s one of my favorites on that particular CD. Tawna, Safe travels. I hope you get that iPad soon! When I came to your article on my iPhone, the poem came up first on the screen. I scrolled to the end to see who the author was. I should have known! If we had to choose one kind of writing, poetry would be enough. As Heidijoy said, “Beautiful poem MT”. I will post the picture and credit from her IG because the normal IG link will not embed. Thanks FOD for bringing this to YT. I’m not sure why, but your comment brought something to mind that leads me to David. Quite often, as I’m driving down the road and my mind is idle, I end up writing poems in my head. Unfortunately for me, they never get written down because I forget them. There is a cadence and rhythm to poetry. In a way, it’s “almost” musical. I can hear it as I write or read poetry. (I’m not sure if everyone hears it that way in their heads. Do they?) Which leads me to David … I’ll bet he hears new melodies in his head all the time. I wonder if he finds himself driving down the road and creating songs in his head, singing them out loud while he drives? It wouldn’t surprise me at all if he did. If so, I hope he uses the little recorder thingy on his phone and gets them down before they disappear. Your iPhone has a Voice Memo recorder. Press it and start making poetry as you drive. 🙂 Press again when done. Save the file when prompted. I do this a lot when I get ideas or need to remember something. When you sync your phone with iTunes, it will be the last item on the left side playlist menu called Voice Memos. Thanks Abrra. I’ll try to remember that! It’s going to be very busy time for me in the next several days, but I’ll try to pop in and keep up with any David news if I can. #36 – Video of The Prayer. This actually felt like a duet. The two times he sang it in Chile, it almost felt like two people in separate areas who just happened to be singing the same song. He would glance over at her, but she acted like she was afraid to look at him. Can’t say that I blame her. If I was singing a duet with David, and I looked at him, they’d have to pick me up off of the floor. That little Lexi is a powerhouse. I don’t know what they’re putting in the water in Utah, but whatever it is, I want some. Abrra…”hand-wringing, pearl-clutcher type fans all over who are convinced that David will only be interested in religious music”. I don’t believe that people are concerned about David and what he is singing. There is only one David yes, but there is a whole world of music to listen to. David himself listens to a great many artists and performs their music. I don’t believe that he would ever think that people listen to or admire just one singer. He has learnt a lot about music from several well known artists. He may sing the same, but where he may be going is yet to be defined for certain. Um… Isn’t that a religious song about the Last Judgment? Maybe a coincidence, but they’re singing “When the Saints go Marching In” in tribute to men who are all Latter Day SAINTS. I guess my point was missed. It doesn’t matter what kind of song David sings, his performance can make one forget the genre and enjoy the spirit of the music. The gathering was for Diabetes. I am certain that there was no consideration of anyone’s particular faith in the choosing of the songs. The songs were all chosen to suit the theme of the evening. Abrra – This was the same experience that I had at the Symposium: I got the distinct impression that I might as well buckle-up, but that it would do no good. That young man has things planned that will blow my socks off, and I am certain that his mainline genre will not be Sunday Hymns. Our son is finally out of surgery. So far, doing well. Love the vids. Love the duets. Love the talent. Thanks to all here. (and to the poem maker) Much love, bluesky. Lynnella, your description of the Chile “Prayer”: made me laugh. That certainly was an odd configuration. But still awesome on David’s part. Abrra ” It doesn’t matter what kind of song David sings, his performance can make one forget the genre and enjoy the spirit of the music.” May I say Amen? Dayzee, that Chile Prayer performance reminded me of hearing Charice talk about her duet with David on his Christmas album. They weren’t in the studio at the same time. They recorded their parts separately and then whoever was doing the mixing, put the parts together. That’s how it felt to me. They both sounded great, and their voices sounded good together, but it would have been nice had they been standing next to each other and interacting like he was with Lexi. It wasn’t a romantic song, so it wouldn’t have been inappropriate, just cordial, acknowledging one another’s presence on the stage. Just my opinion. Bluesky, glad to hear the good news on your son. Praying for a speedy recovery. Didn’t see the Tarzan movie either, so song wasn’t familiar to me either. Lynella, I thought the two singing beside each other was better too….an actual duet. Abrra, ” It doesn’t matter what kind of song David sings, his performance can make one forget the genre and enjoy the spirit of the music.” You are so right! Bluesky, best wishes for your son and a speedy recovery. Hugs to you, his mom, that you will have peace of mind and heart as he goes thru all of it. I was just thinking about a big reason why he’s off social media. Just think about the big stink so many people made over the marriage comment he made from the conference> WOW !!! And he probably has gotten tons of nasty tweets over the last few years, especially before the mission. I’m sure he enjoyed not reading stuff like that for two years. Then he comes home and POW, lots of negativity. I know he also gets lots of positive feedback, but for a sensitive person, those mean tweets would be hard to deal with. And how can you feel happy and in touch with yourself and write with all that stuff filling your eyes and thoughts. He is working on his music and career the way it works best for him .That’s a good thing. Hugs !!!! Oliveoil – I agree that David doesn’t want the hassle of having to watch every word and always be sure he’s politically correct. But, I think it may also be that he doesn’t feel the need to have attention drawn to his personal life. He wants a career, but not the celebrity that goes with it. He’s always been a spiritual person, but now, I think he just doesn’t worry about letting people know it. Most of his postings are inspirational in nature. Also, he knows God has a purpose for his life and he plans to use music to accomplish that purpose. We may be let in on his career doings, but I would be surprised if he ever goes back to telling us anything else. He’s a private person, and I think he wants to keep it that way. I don’t know about anyone else, but that’s okay with me. Jan – When he was little, it was his cats in the backyard wanting to hear him sing, now it’s all of us, some cats, some old hens (myself), but it’s mostly about the music. Tawna, Jans, Dayzee, and all: thank you for your prayers. I do not usually share personal things on this site. This time I did because we are fewer contributors, and I wanted peeps to know why I was gone for a while and still may be from time to time. My son is doing well. He had some “stuff” go on that required them to go back in… twice. So he had 3 surgeries in less than 48 hours. The doc was pure tuckered out! Not to mention all of us. But as of early this afternoon, it looks like all is steadily improving. Bluesky – So glad to hear your son is doing well. God is good and He answers prayers. We’d all be in trouble if He didn’t. I can’t imagine how worried you must have been with him having 3 surgeries almost back to back! I’m so glad to hear he’s now doing well. Bless you both. Wishing him a speedy recovery. Bluesky, so glad that he is doing better now. Yes, I know how you feel about putting personal things on here. I never wanted people to think that I have troubles that others don’t. But, no one on here thinks that so sometimes I do share personal things. It has always made me feel better just “talking” to someone. I’m the grief group leader at church, so I know how therapeudic it is sometimes. Today, I was so busy, I never even heard one David song. Feel like I’m having “cold turkey” withdrawals! 🙂 Off to bed and listen to his Forevermore album. Whether David sings fast or slow songs, I’m definitely clutching my pearls, because it’s obvious from his rendition of “He Lives in You” that his intention is to bring as much spirituality and/or religious emotion into his performances as possible, even an originally secular song like that. His body language on the little snippet of “Saints” suggests to me the same passion he brought to the Lion King song, not a return to the jazzy, bouncy David of old. But I hope that I’m wrong, because personally, I’d love a return of the musically-driven David, rather than the religiously-driven David that we’ve seen in the past year. Sunday puzzle brings back a fond memory of Idol Tour. Beautiful puzzle, Abrra! All my favorite colors entwined. I used to use the photo taken from the stage side for my wallpaper in the earlier years. #15…Dang, I still want to hear and see the whole song/video! Guess there never was a video of the whole song?? I love the passion David has for his faith, it’s admirable IMO. But I too am waiting for that passion in all his music. It’s coming, I feel it in my bones 🙂 You have to understand that I have the reputation of being very patient though I am pretty anxious for September and November. I’ll be seeing him live for the first time since his return. Now if he announces something in So Cali before then, I am so there! Bluesky, Praying for you son, Dr’s, nurses, and family. May he receive the healing needed. Jans, You are the hashtag queen! Lynnella, From one hen to another lol, that voice is getting ready to be heard. Someone, The last judgement? I have no idea, it never occurred to me. It is such a jazzy upbeat song that I always thought of it as celebratory. I’ll have to check it out. SB, “I don’t believe that he would ever think that people listen to or admire just one singer. He has learnt a lot about music from several well known artists.” David sure has exposed me to all kinds of music, I’ll admit that some leaves me scratching my head lol. With that said though I do listen to all kinds of music, none and no one has touched me as he has. It is what it is, I’ve stopped questioning it. It just gives me a headache haha. MT, I love the cadence in poetry. The rhythms rhyming words make when strung together in such a way that it makes your soul dance. One of the first books of poetry I read was “Where the Sidewalk Ends” by Shel Silverstein. As much as I love reading in general I don’t have the gift of writing. Thank you for sharing your gift with us. David tweeted a RIP yesterday for an Elder L. Tom Perry who passed at the age of 92. He was one of the 12 Apostles. I’m intrigued by the quote David chose to reflect on in his tweet, he is very human just like the rest of us. Oh and by the way I may not be in the popular crowd with the Lexi duets, PLEASE stop them. I don’t find her voice appealing. She doesn’t have the experience on how to duet, you don’t scream sing over the other singer. I did prefer the second The Prayer from Chile overall…..sorry. No argument here. Singing a duet live is not easy. It’s not like they have a sound mixer to balance the voices, so a singer must have the professional maturity to perform so as to NOT over sing the duet partner. Lexi is so “professionally” young and may not sing too many duets. She needs more guidence from those who tutor her on voice. On this score, I will have to trust the Archuleta. He must know something that we do not where Lexi’s skills are concerned. Here is an example of Masterclass at work. Abs, I can’t say I wasn’t warned (Sunday puzzle brings back a fond memory of Idol Tour) but when I finished today’s puzzle my memories were extremely fond. That was how David looked the first time I saw him in person. Singing and playing the piano as it rose from below the stage level shrouded in fog. I think they did the fog thing to ease us into that charismatic presence. So our brains would not be fried. Well, that didn’t work. I am too biased to be on the jury of the great duet debate. If anyone is singing at the same time as David they are only backup singers for me. It is very annoying when someone has the nerve to out-volume David. I did think Lexi had improved since the winter programs. I don’t think it is because I have become more tolerant because I haven’t. I did love the Jeff LeBlanc duet. Interaction was great. I just bought this. I’m praying we get a full cd/dvd of the celebration of Christ winter concert. That Voice! Dja #65 and Abrra #66 and Dayzee #67…. thank you…. I was afraid I was the only one feeling this way. I appreciate what you have said and the way you’ve said it. Lexi has a beautiful talent to be encouraged to grow, but for right now singing live duets is not a good thing. imo. And, I too, prefer the Chile duet. But, David and Jeff LeBlanc…..YES! Thank you for the puzzle Abrra! Tawna, Yes more Jeff Leblanc duets! That was way cool! IMHO the MP3 by a fan is just as good as the promoted song on that site which promotes Kevin Olusola more than others. The main reason I like the “duet” is because they are standing next to each other like most duets do. I am tolerating Lexi because David chose to sing with her. 🙂 As far as Jeff Leblanc, I am probably standing alone in my opinion because I never cared for his singing. I tolerated him singing with David for the same reason, but just do not like his voice for some reason. Love that Do You Hear What I Hear Rainstorm. David is just brilliant doing this song! Thanks Dja! I always liked this duet, even tho it seems Landon was trying to outdo David some.. His vocal chords seemed to bulge compared to David just singing along, smiling. My thoughts are with you during these anxious times. Thoughts and prayers from friends do help in a big way. I wish a steady recovery for your son during each passing day. EXPERIENCE LIVING PROOF AT TOFW AND TOFG! We know the school year is coming to a close for many of you and that you’re thinking about summer fun and summer plans. While we love the summer too, for us, this time of year means we’re getting ready to come out on the road and see all of you in a few short months! We loved our Spring 2015 Living Proof TOFW weekends so much, and we can’t wait for our Fall cities to experience the Living Proof tour! In case you’ve never had the chance to experience a TOFW or TOFG weekend, we wanted to give you a sneak peek and share what TOFW and TOFG are all about! In 2012, David put his singing career on hiatus so he could serve as a full-time missionary in Santiago, Chile and described his experience of the mission as “a dream come true.” David returned from Chile in March 2014 and has since traveled to the Middle East to perform for U.S. troops, recorded the song “Glorious” for the recently released “Meet The Mormons” movie, and been busy writing songs for a new album that will be released in 2015. Cities that also include a Time Out For Girls event. Abrra, I read that over at FOD, but now I can’t get tne comments to come up over there, I alo jon in with your Yioee! Goodness, please excuse all the typos! “The Best is Yet to Come”! “Patience”! We were told both of these. One from the “Man” himself & one from Kari. I am so excited to see that believing in them are coming to be! WOOT! WOOT! Thanks for the find Abrra! Bluesky, I’m very glad your son has come through his 3 surgeries(gah!)! Prayers for him and your family for a healthy & speedy recovery! He will be performing at two events, Australia and New Zealand? Those are the only ones listed on his page. Adding my yippee for #76. I prefer this synopsis of David’s credits over “American Idol darling” and “hasn’t done anything with his music since his return from his mission”.. Kudos to whoever put that together. I love 8throwcenter’s fan video at #70. That is what I want to see. All David except for a brief glance at the stage to orient us to his surroundings. #81 – Someone – I noticed that too. He’s only scheduled for the 2 events in Aug. I don’t think I can go to Australia or New Zealand (sigh). That still leaves June and July with nothing. Maybe he’ll be finishing up his album and releasing it soon. Have we had any word on when it might be out. How exciting for him and fans in those parts of the world! And of course hoping for video or livestreaming! Someone, he will also be in Mexico in July according to tweets I’ve seen. How wonderful for the Aussie fans who may have thought they’d never get to see David in person. Doesn’t he always sing at these things? I hope they all get to go! And it looks like he has a week in between appearances so he may be able to get some sight-seeing in. I know I’d want to, if I was going there. David always seems to want to be a support to his duet partner . Like when he sang with his cousin, and Let it Be with Brooke. The only time I really remember him blasting out was when He sang Have Yourself a Merry Little Christmas with Ray, and even then, he was playing around. How sweet and heartfelt is this? 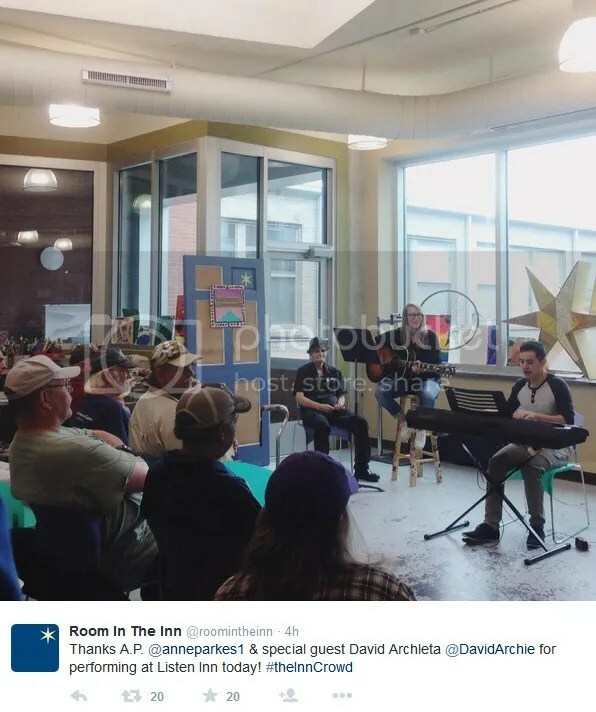 David entertained today at a homeless shelter in Nashville. Nice David 🙂 We all need our spirits lifted. Oh yes, much prefer David backing up/singing with David! Ha! Ha! Oliveoil, thanks for the reminder of that duet with Ray. What a fun night that was! Hilarious. And so true that David supports his duet partner. Always dropping down to the second part to allow his partner to take the melody. And yes MT & Angel, David is his own best singing partner. That is why Begin is my favorite album. I wouldn’t mind casually meeting David Archuleta. That lucky Anahernandez. A homeless shelter in Nashville? I’ve got to get myself down to the Senior Center. Pretty sure he will show up sometime. #96 Dayzee – You’re a hoot! Take me to the senior center with you (lol). Hope we don’t have a long wait. At my age, I don’t have too long to wait anyway. If he doesn’t show up, I’ll hear other angels singing. I loved your poem, MT. I’ve always loved poetry and wish I had the ability to write it. most played on my phone. I’d forgotten about this duet. David didn’t hold back here. Maybe because he new she could hold her own?